lpcs webmaster, Author at Infrasense Inc.
A 2014-2015 New York State Thruway Authority deck rehabilitation project on I-87 in Rockland County, NY utilized ground penetrating radar (GPR) to assess the condition of two asphalt overlaid concrete bridge decks carrying mainline traffic. 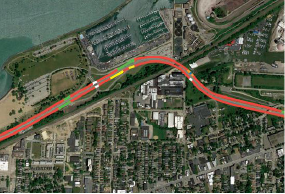 We used high-speed GPR to map changes in the pavement structure along the Cleveland Memorial Shoreway. The results were presented geospatially with different color line segments corresponding to different pavement structure classifications. Learn More.